When it comes to the Italian brand that is Moto Guzzi, it’s easy to argue that the qualities of individuality and uniqueness go hand in hand with the marque. 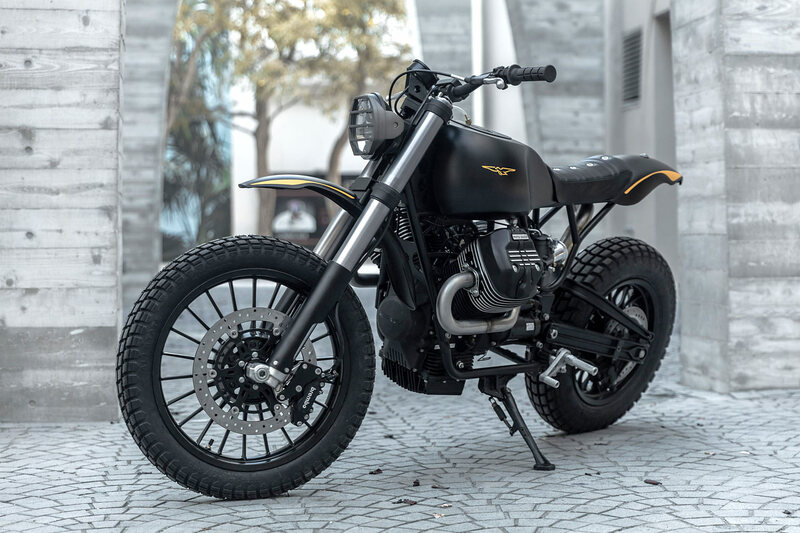 So when Moto Guzzi America was searching for four builders to take part in their V9 Pro Build series, those two characteristics were essential. That and being a world-class craftsman. Enter the final piece to the puzzle – sculptor, winning rider and race team engineer Bruce McQuiston. 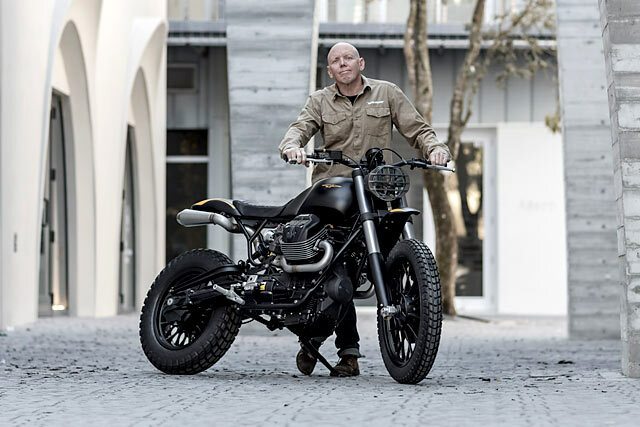 Bruce is the visionary behind Moto Studio from Miami, Florida and given the keys to a brand new Moto Guzzi V9 Roamer, he’s handcrafted an Urban scrambler he calls the ‘Braapster’ to shred the streets of the Sunshine State. 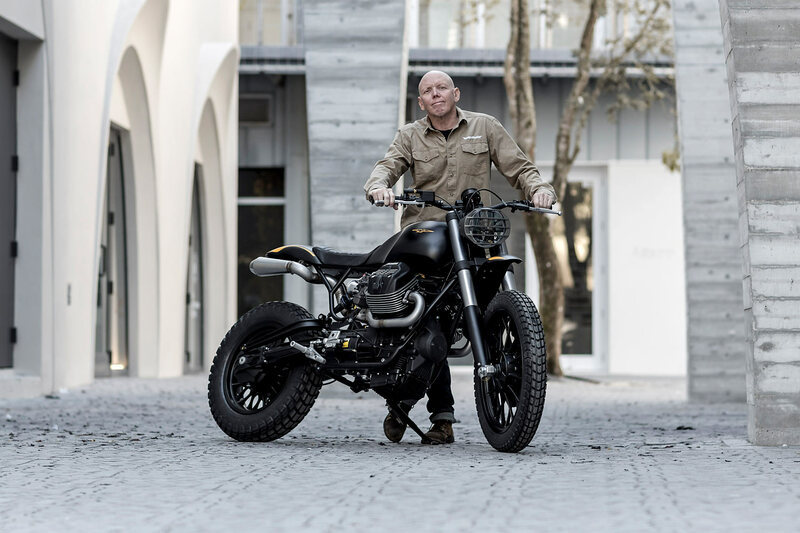 Looking at Moto Studio’s previous builds and the factory styling of the Guzzi V9 it would be easy to assume that Bruce might have gone in a different direction but he explains the rationale. 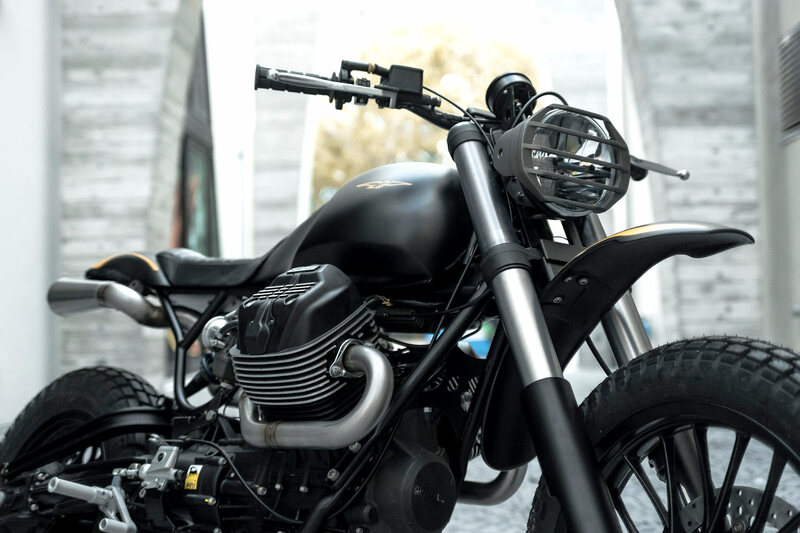 “While Moto Studio has thrived on a lineage of cafe racer builds, the combination of less than stellar roads and far worse drivers has created a need for a bike that allows one to take interpretive paths, hence the V9 Braapster was born.” Starting with the Tonti inspired frame, it was modified and cut back to accept the changes to come, but first the stance had to be in order. To allow the V9 scrambler to handle any and all conditions thrown at it the standard forks are ditched in favour of an upside down front end with a healthy 8″ of travel. But the real genius is at the other end, the rear suspension is based on the factory swing arm, re-engineered and fabricated to accommodate a mono shock setup, also with 8″. Bruce sourced a Sachs Formula Matrix 4 way damper initially designed for various formula and prototype race cars. With motion ratios, valving and spring rates formulated for its new task, the Braapster is ready for any over the curb mission required. As you can imagine with a trained sculptor leading the crew the body work is all designed and fabricated in-house with an emphasis on both aesthetics and weight reduction. 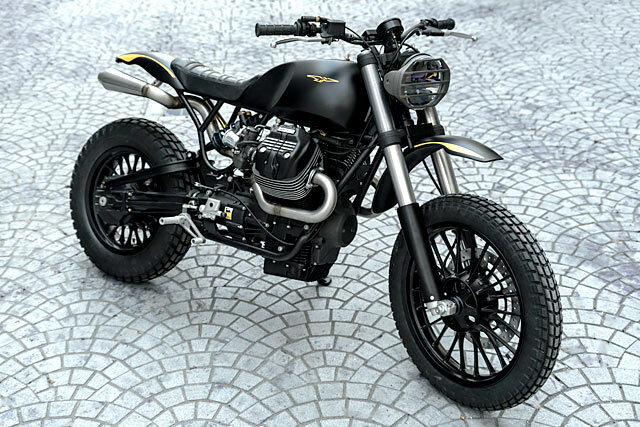 With the factory steel gone the replacements instantly shift the look from Sunday cruiser to serious Urban Scrambler. 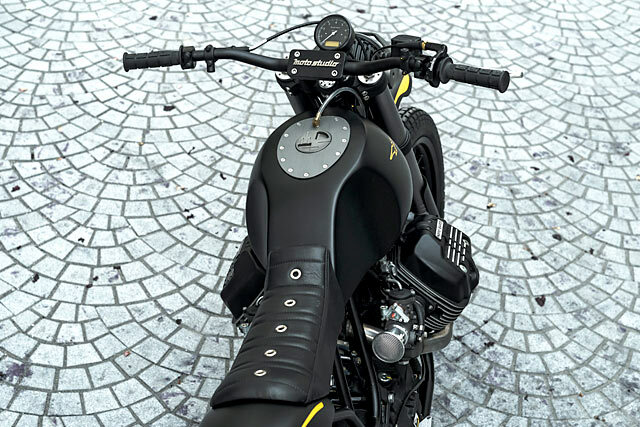 The tank’s broad shoulders quickly flow towards the centreline of the bike creating a dramatic piece that is softened by the use of matte black and yellow. The tail section gets the mix of form and function just right, while up front you get an all-encompassing guard that’ll catch anything thrown its way. 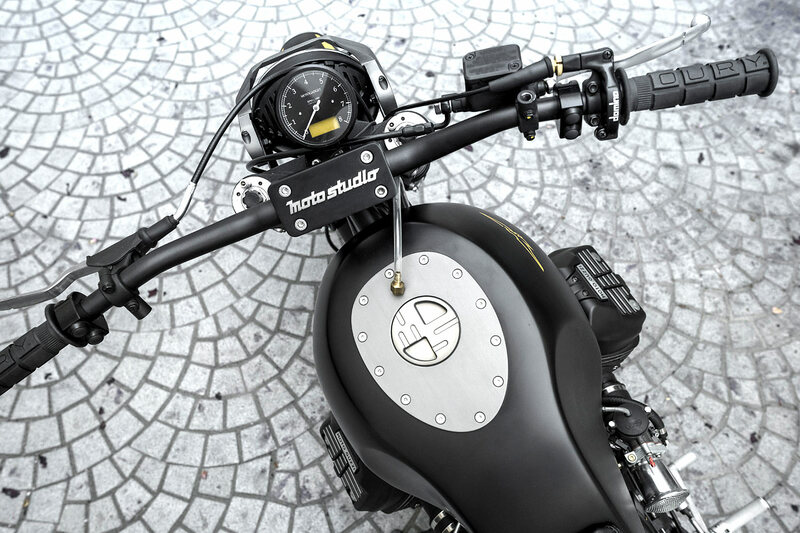 Giving the rider a place to call home, the seat in black leather with metal accents is all business. 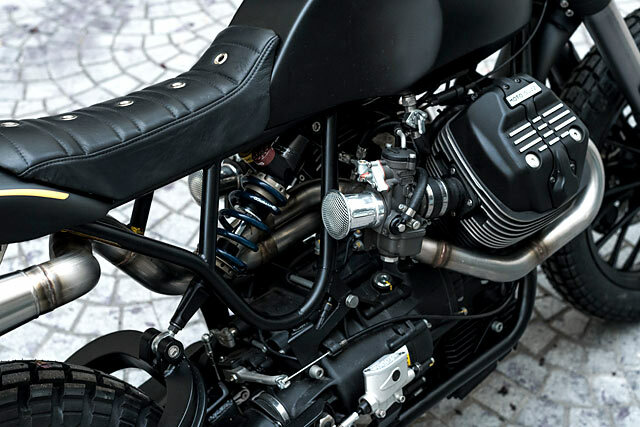 The engine is unmistakable Moto Guzzi V-Twin, here with 853cc of air-cooled power with thumping torque across the rev range. But modern engines have become electronically very complex, the upsides are huge but so too the nightmares if things goes wrong. 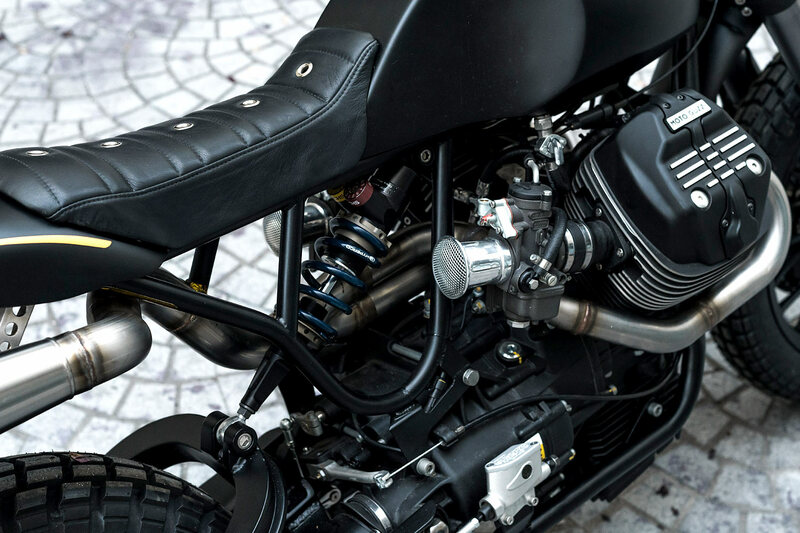 So to simplify things a set Dellorto PHF 36 carbs mounted on Moto Studios own intakes now fuel the fire. It gives the engine the sweet visual vibe of the marques creations from the ’70s complete with retro velocity stacks. While on the other side the hand-built 2 into 1 exhaust system is a thing of beauty; you can almost picture the hot gas fleeing down the pipes with joy. There is a beauty to the sheer absence of clutter the sculptor has created that would instantly be lost with a messy modern wiring loom. So Bruce had a solution. 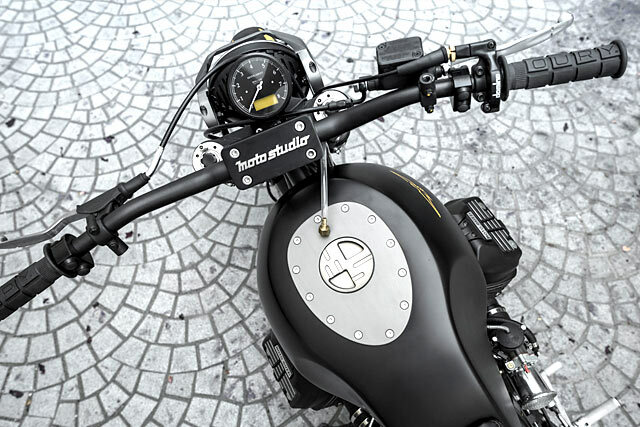 “As with all previous Moto Studio builds, the use of Motogadget electronic components which are not only bullet proof, but are flexible in their capabilities and minimise the footprint of the wiring harness.” The lighting is kept simple too with an LED combo light at the rear and a flush mount headlight up front. But it’s the grilled out light that is the beginning of an array of bespoke machined parts that pepper the Guzzi. 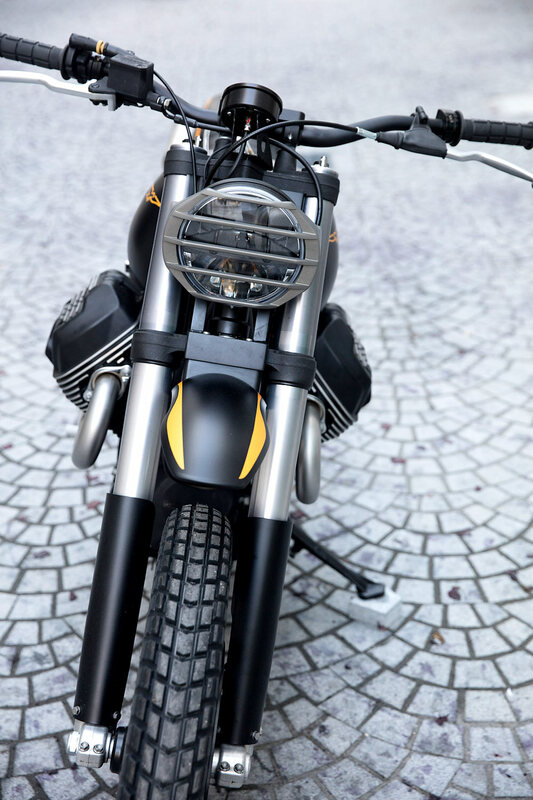 That grille gives Braapster a distinct sense of purpose as it fires towards you lights ablaze in the warm Florida nights. 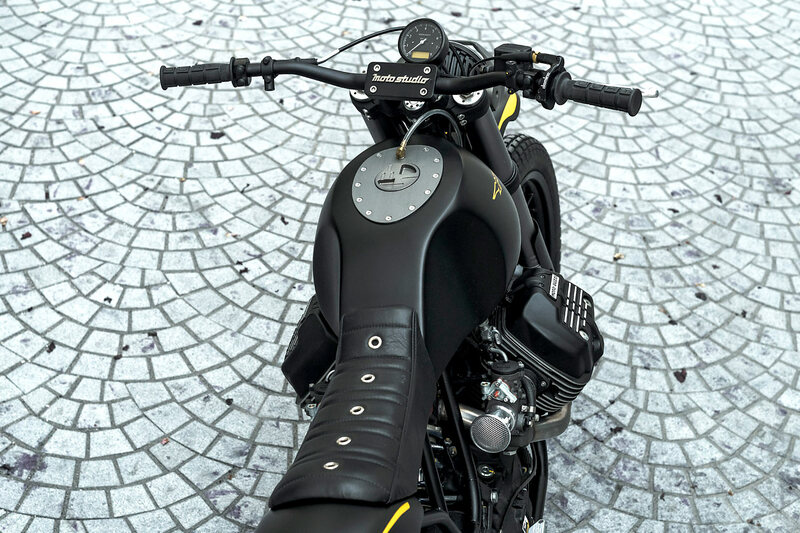 The gas cap and mount give the tank a very race car inspired feel no doubt taken from Bruce’s past. The mounting plate providing a touch of quality automotive engineering while the caps detailed machining is flawless. A Moto Studio clamp secures the motocross styled Renthal bars which are dressed up with the best from Motogadget and Domino, high-end and no fuss! 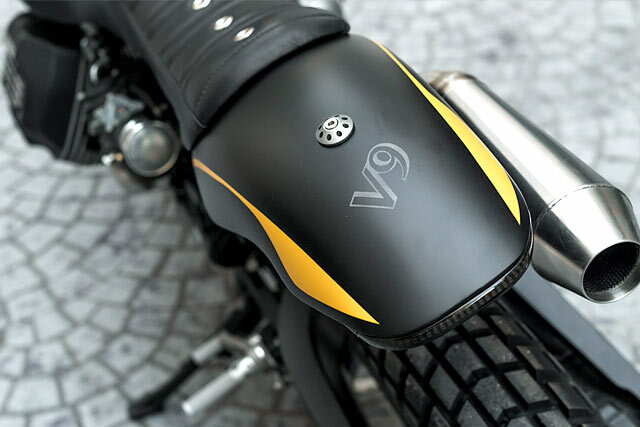 Unlike the stocker there is no big chrome mirrors either, just a gorgeous Motogadget analogue tacho to tell the tale. 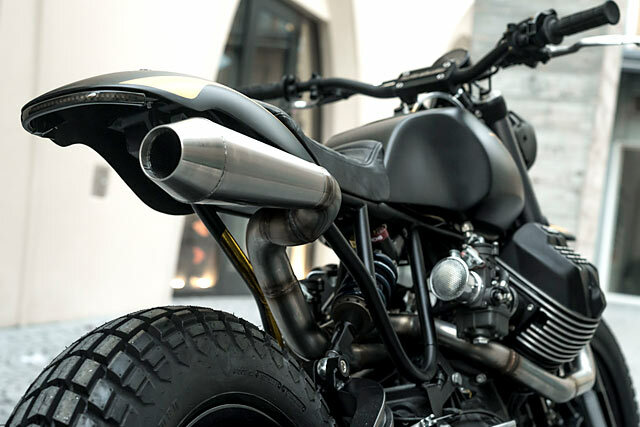 Finally the wheels were wrapped up in Allstate Dirtman tyres and this Urban Scrambler was set for speed. 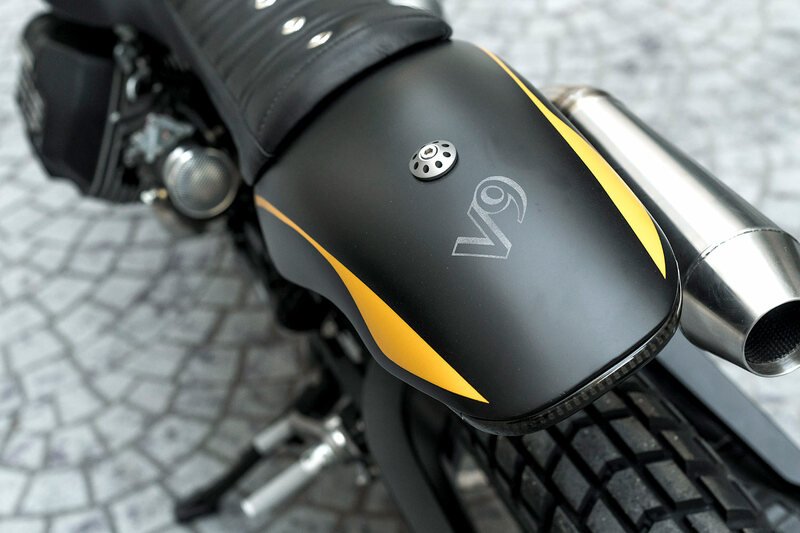 “Clearly there is no one motorcycle for all rides, however the V9 Braapster will provide solid entertainment for most rides thrown at it.” Explains Bruce. 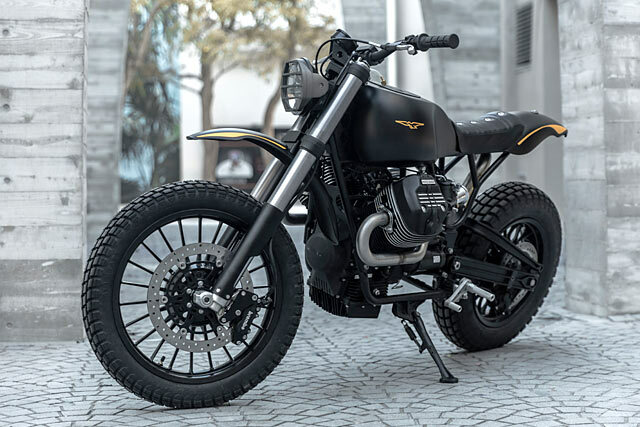 Moto Studio has delivered a truly unique take on Moto Guzzi’s V9, replete with the workshop’s signature good looks for all occasions.